Captain Cook was a fan of this region and it was he in fact who decided he would call it the Bay of Plenty. This happy name was bestowed after rather more successfully resupplying his ship and meeting with more welcoming Maori than he had encountered around Gisborne (that area got landed with the name Poverty Bay). And land of plenty this area continues to be for its many visitors in search of heaps of sunshine, water activities ranging from swimming with wild dolphins to surfing, stunning beaches (you're bound to find something to suit in the area's 259 km of coast), fresh as it gets seafood and unique experiences which include the likes of exploring a highly active volcanic island. Heading inland you will find Rotorua – the country's centre for all things geothermal and so obvious is it here you can't avoid it. The smell of sulphur hangs forever in the air (you do get accustomed to it) while steam clouds rise and hiss from street-side vents. Rotorua's wonderful mix includes the naturally dramatic by way of geysers, bubbling mud pools, natural hot pools, any number of stunning lakes (not just Lake Rotorua) alongside the culturally significant and the action-packed adrenalin activity menu. Take part in a traditional Maori feast, try your hand at a spot of flax weaving or simply sit back and enjoy a dazzling and moving cultural performance of song and dance. As well as being New Zealand's main thermal wonderland Rotorua is also known as the adventure capital of the North Island, giving Queenstown a run for its money with some awesome tandem skydiving, zorbing, the chance to white-water raft the highest waterfall known in the world of commercial rafting and much more. Rotorua and her environs are simply bursting with geothermal attractions but the stunning natural setting of Wai-O-Tapu gives it a major advantage when it comes to choosing one (because you couldn't possibly visit them all). Comprised of fantastically coloured silica terraces and vividly hued pools, there are a couple of other major point earners for Wai-O-Tapu. One is the fact that here can be found the largest boiling, bubbling mud pool in New Zealand and the other is the presence of the Lady Knox Geyser which puts on a dramatic show of erupting on a daily basis. Like almost everywhere in New Zealand, hiking and tramping opportunities abound and there are some real gems in this region. Trails range from options for the not-so-fit more intent on a slow ramble to those looking for serious trekking challenges. 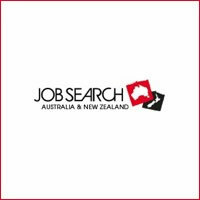 Should you want to get out into the wilderness but lack confidence to go it alone there are heaps of guided walks and treks up for grabs, some of which are themed to special interests such as local flora and fauna, Maori legend and lake myths or history. The i-SITEs of the region are as always a wonderful resource for maps, walking trail literature and otherwise handy information – much of it won't cost you a bean. On the short walks front a few worthy contenders are the Redwood Memorial Grove Track, the Blue Lake Track, and the Okere Falls Track which not only rewards you with a view of the falls but also of all those who are risking life and limb to get their white-water rafting or sledging fix. For more information on a walking theme or if you are looking for something a little lengthier, the Department of Conservation have a wonderful downloadable leaflet called 'Walking and Hiking in Rotorua' which is an extensive detailed publication of anything and everything which can be enjoyed by walkers and hikers. Imagine paddling across a hushed lake as the last glows of the sinking sun linger in the sky and twilight descends, to arrive at some hidden away natural hot pools - impossible to get to by land. Or perhaps your idea of some ideal lake time is a slow relaxed paddle which weaves in and out of caves....or perhaps a guided kayak trip which regales you with legends or teaches you all about the history and wildlife of the area. All of these and rather a lot more are on Rotorua's highly diverse menu of kayaking or canoe options although if there was a common theme for all it would be the fact that each is unforgettable in its own way. And just to add extra factors to the whole diversity issue – don't forget the Rotorua area has a lot of lakes. Many come to this region to hike up Mount Tarawera and it isn't just so they can tick 'climb a volcano' off the must-do list. 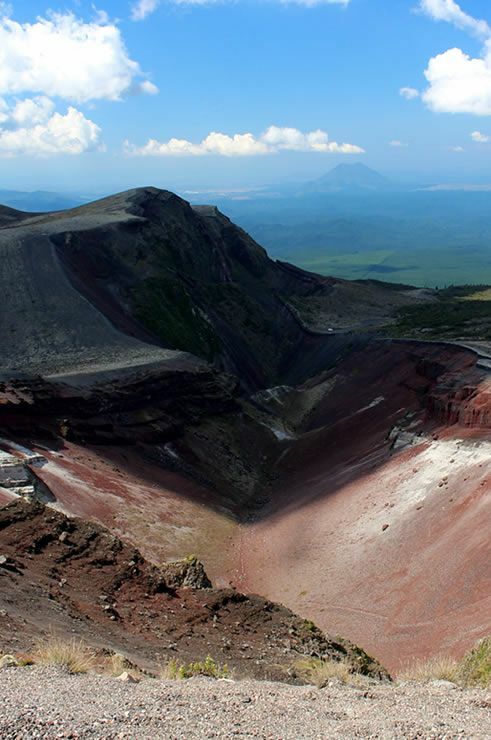 Once you arrive at the summit here there is the option of a 100 metre scree slide into the actual crater itself. It's not every day of your life you get to say you've done that! You can huff and puff your way to the top of this volcano on a guided tour or under your own steam and so lovely are the views of hills, mountains, volcanoes, lakes and ocean once you reach the top that some take the no-effort required option of a 4x4 drive up for that reason alone. Te Wairoa, along with several others settlements, was one of the villages which disappeared under layers of volcanic rock, ash and mud one night in 1886 when Mt Tarawera blew her top. Around 50 years later excavations began on the site where more than 150 lives were lost on that chaotic night. What can be seen today at the marvellous 12 acre Te Wairoa is the result of 70 + years of redevelopment which has been carried out with sensitivity and respect. You can stroll along a series of interlinking paths to see the buildings which the archaeological exploration brought once again into the light of day. The evocative air of the place is enhanced considerably by the guides who each sport period costume. Highly informative interpretation panels are dotted around so you will understand what you are looking at while the award-winning museum on site will allow you to check out the finds recovered from the archaeological digs here. If there is one thing which Rotorua has in numbers too large to count it is hot springs and thermal pools. In fact, so lauded have these natural features become Rotorua has developed something of a reputation and folk come from all over to soak away their cares – both bodily and spiritual – in these curative waters. The privilege of doing so can cost nothing short of a small fortune at the luxury end but budget-watching backpackers rejoice – you get to play thanks to a few spots which are offered by Mother Nature for absolutely nothing. 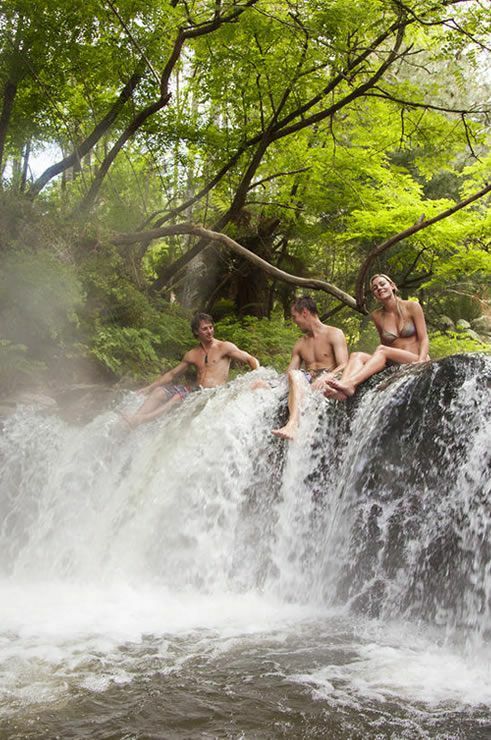 The loveliest is perhaps Kerosene Creek with its lovely bush setting and whose prettiness is enhanced even further by the waterfall which cascades into its thermal pools. If you do want something a little more organised and which comes with spa treatments such as massage and facials too there are plenty to choose from. Most will typically offer private and adult-only pools with views tending to be of the make-you-go-oo variety. Not all of them are out of the reach of backpackers either, especially if you keep your eye out for special offers or money-off coupons in hostels or in backpacker literature. All kinds of folk rock up in Rotorua but generally speaking the town has two major draws – its geothermal wonders and its Maori culture. Around one third of all who call Rotorua home can claim Maori descent so it may come as no surprise to learn that here is where you will find a fine offering of cultural performances. As with the geothermal sites, it really won’t be possible to cover every Maori cultural experience so you’ll have to narrow your choices down; should you have to pick just one you could probably do no better than direct your culture-seeking steps towards Te Puia. The programme of activities, tours and attractions here is so diverse we couldn't possibly hope to cover even a slice of it but it will whet your appetite to know it includes such treats as traditional feasts, age-old craft making exhibitions (which you can try your hand at too), cultural performance spectaculars and a traditional welcome. 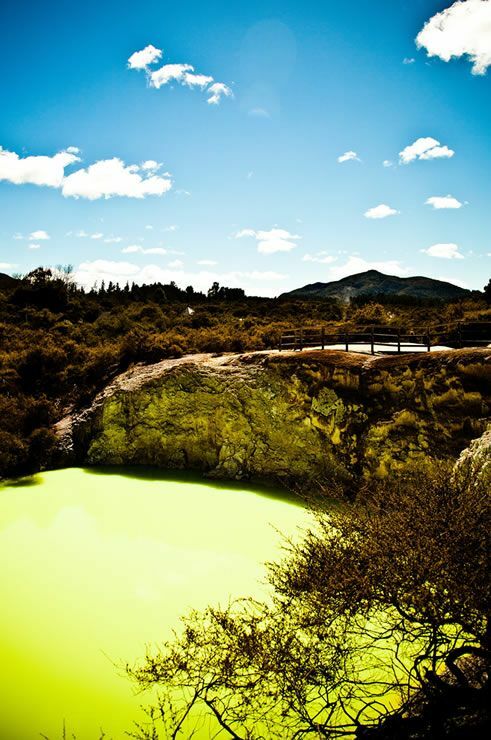 And, just in case you’re still undecided, it might help you make up your mind to know Te Puia is also the site for the geysers, mud pools and silica terraces known collectively as the Whakarewarewa Thermal Valley, so you can cover two must-sees in one fell swoop. Rotorua is known as Queenstown's northerly counterpart – in short, the adventure capital of the North Island - which makes it heaven for adrenalin junkies. Rotorua has everything Queenstown has (although admittedly not usually in the same numbers) and actually a few things Queenstown doesn't. So pick your bucket-list entry of choice – skydive, bungee, zorbing, white-water sledging, off-road dirt biking and so forth – and then set off to find where you can do it because it will be here somewhere. 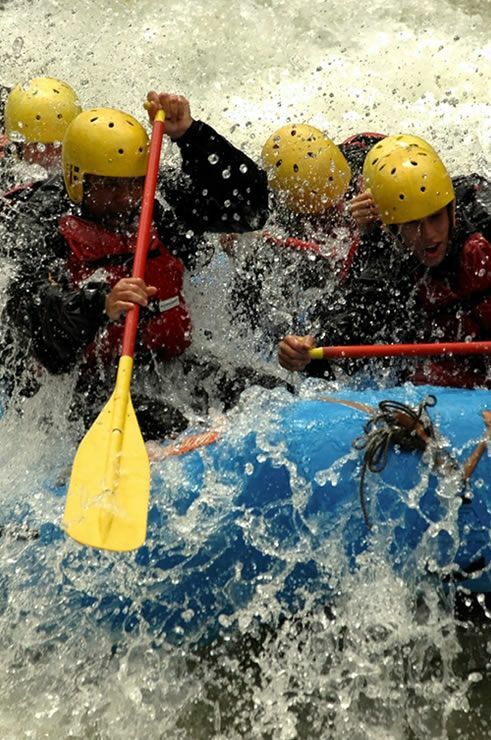 Undisputedly though, the biggest jewel in Rotorua's adventure activity crown is white water rafting because in these parts it is as good and as extreme as it gets anywhere in the country along with jaw-droppingly beautiful scenery to boot. Within a very small radius you will find everything from calm and meandering to violently turbulent which scale the highest heights of white-knuckle possibilities. There is even an option for rafting a river section which is only open for 26 days each year, depending on the hydro-plant dam there. Prepare to be shaken, spun and catapulted cannon-ball style through gorges and rapid sections and if you sign up for a rafting trip on the Kaituna/Okere River you will get to experience the gut-wrenching drop of the world’s highest commercially rafted waterfall – Tutea Falls. Featuring as a regular bucket-list entry, swimming with dolphins in their own environment is possible in many parts of New Zealand including a few options which operate from the Bay of Plenty coast, notably Tauranga. You don’t have to get your hair wet to make friends with the dolphins either because dolphin watching trips are every bit as possible as the dolphin swims. Other marine wildlife you might encounter or go in search of include orcas – which are actually the planet's largest dolphin species which most will know by the title of killer whale - sting rays, turtles and giant sunfish. These waters are so full of dolphin species that most tour companies will offer another trip free of charge if no dolphins are seen, knowing full well that is a rare occasion. Additionally, some of the dolphin swim/dolphin watch operators allow underwater viewing of the dolphins through specially rigged up camera systems on board their craft. Every so often New Zealand dishes up something so extra special it can really be described as unique – that otherwise much overused word. 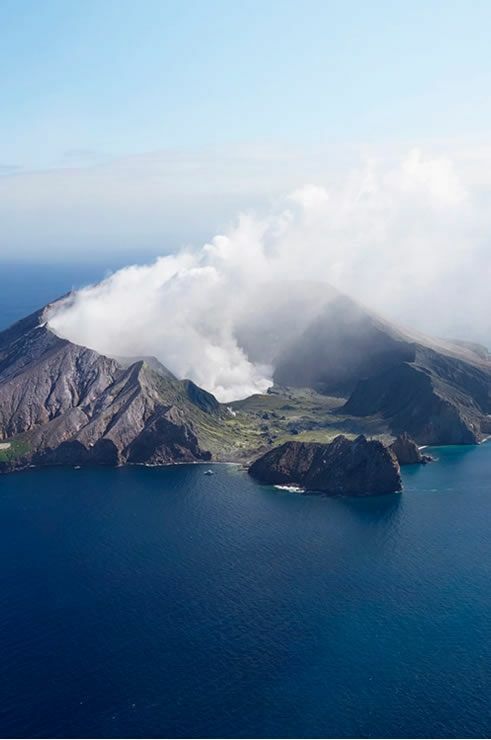 Sitting 50 km off the coast of Whakatane in the Bay of Plenty can be found one such wonder – White Island. Even from the mainland, clouds of smoke and steam can be seen rising almost constantly from this volcanic island which is still very much of the alive and kicking variety. Tour companies ferry visitors to this island by boat or helicopter and although you probably wouldn’t expect the landscape of an actively volcanic island to look normal, nothing can prepare you for what awaits your senses once you set foot in this alien world. Whatever you have imagined....this is better! First you will be primed about emergency evacuation procedures and then, sporting hard hat and gas mask (which is very much a necessity), you are going to traverse a land which hisses steam, boils pools of mud with a level of violence and presents a thousand weird and wonderful formations of brilliant-yellow sulphur deposits. The beautiful but deadly poisonous crater lake is a highlight as is the visit to the atmospheric abandoned sulphur mining factory ruins where all the miners and workers present were killed in a volcanic event in 1914. Rotorua Tourism - Everything you need to know about the area!